I started out as a trainee scientist at an electronics research centre at the age of 16, armed with only a handful of O Levels, but an enormous amount of enthusiasm and dedication. I experienced design and innovation at the highest level, and worked with some fabulously clever people on some amazing projects at the cutting edge of science, including ultra high performance and high reliability components for satellites and military systems. In fact every day was filled with the excitement of learning new ways of doing things, and watching ideas being taken from the drawing board, through to prototype and then to the sophisticated end product. I educated myself during every hour of my spare time to supplement my knowledge gap, and, sponsored by Plessey and helped and mentored by my colleagues, I graduated with a first, and ultimately progressed to senior scientist. Do good ideas equal business success for an entrepreneur? The general feeling during the 1980s was that you could be successful in business – if only you could come up with a good idea. I had lots of ideas…but were any of them any good? 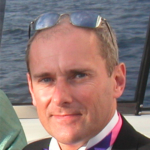 By this time I had met someone at Plessey Research who was to become a life long friend (and ultimately my business partner): Dominic McGuinness. I presented some ideas and prototypes to him, including an automatic washroom tap. It detected your hands through the ceramic sink basin, and turned the water on using some technology I had developed whilst studying. At the time it was a real breakthrough, and a high tech product. Dominic subsequently managed to secure a meeting with the MD of a national washroom facilities company, who wanted us to install one at his home for him to test. If successful, he would give us a contract to supply all the service stations up and down the motorways of the UK. This was a huge opportunity for us, although it came with some pretty high risks, as the technology would need to pass many compliance tests. The tests and development would incur very high costs too. We pondered our first sign of success, and wondered if there was something more appropriate than this high-tech product as a starter in business? Maybe something that was easier to digest than an entire elephant! High-tech taps or low-tech house plaques? So instead, we looked for low-tech products – in fact, very low-tech products! We identified what appeared to be an expensive end product, made from low cost, high quality components. A cast iron house name plaque – the type of thing you hang on your wall outside your house to denote your house name or number. In fact every house has a version, from the simplest house number, to the most ornately decorated. It didn’t fit our high tech backgrounds, but it had all the hallmarks of a first business. It was something we could make easily in the UK, for a fraction of the price of our competitors, simply by changing the manufacturing process. This would give us a strong competitive edge. We originally made the plaques to customer order. Using our newly developed technique, we were competing with existing manufacturers and cottage industries. It was profitable but slow going. We wanted to really disrupt the market, and sell thousands, not just 10 a week! We quickly realized that the unique way we were manufacturing allowed the customers to finish the product themselves, and that we could supply the whole product in kit form – complete in a box. In this way we could go into mass production, which was much more exciting…the Henry Ford approach! This was our opportunity, so we decided to set up our business. There were a few things to put in place. Firstly, a name: we came up with ‘Solution Products’. We wanted to reflect our desire to make products that solved problems. As it turned out, it wasn’t the catchiest of business names! We also needed cash, and time to set up the business. Dominic left his secure sales job, to start selling our new product, which by now was actually a nicely prepared prototype. I also left my secure job, and spent the next year contracting, such that I could earn enough money to support us both. Five years later, we had over 800 retail outlets selling our unique consumer product range in the major UK DIY chains, high street stores and garden centres. At this stage, we were constantly looking for more products to put through the pipeline, and to improve our designs, in order to earn enough money to survive. The pace of change in these markets was slow and new designs, my lifeblood, often only involved a colour change, so it wasn’t very rewarding. We were also spending considerable amounts of cash on graphics and packaging design. It bothered me that we had no real method of determining whether our investments in this packaging design area were better than the previous versions (other than gut instinct, and some kind words from the very nice graphic design company!) This frustrated me, as our outgoings in this area alone were far more than our annual salaries. I wanted a more scientific approach to the question. Were these good packaging designs, or were they just a money spinner for the graphic design studios? I had a light bulb moment – if we could mount electronic sensors on our display stands, we could count the number of customers that stopped and looked at our new package designs, and indeed how long these customers actually looked at our product for. This would give us a much better feel for the effectiveness. From these statistics, coupled with sales, we had a much more robust data set, where we could gather incredible insights. We decided that this was such a valuable analytical tool, and that other businesses could use it too. 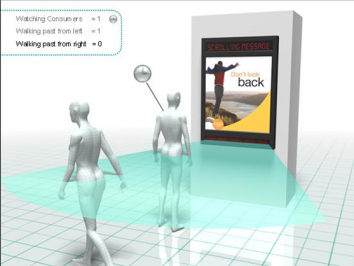 So our vision was to build an electronic tool, that could be placed on any display stand allowing manufacturers and brands the ability to scientifically analyze customer behavior. This really satisfied our desire to re-enter the high tech world that we so loved. We decided to sell the consumer product range. So we scribed an advert, and immediately placed the business up for sale in 1995. Eight weeks later, we had sold the business through the Financial Times Business for Sale pages. We now had a fairly blank canvas, a loyal employee, and a really good idea (albeit untested and ironically without any market research, given that we were about to enter the market research arena!) We wanted to keep our history for trading purposes so we asked the new owners if we could keep the business name if we added Systems on the end. We were now known as ‘Solution Products Systems Ltd’ which we quickly abbreviated to SPSL. Dominic once again took the prototypes, ideas and our invention to the market place, and with a good reception, we soon realised it had been a good move. 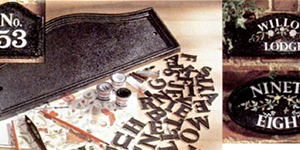 We actually found business with the same DIY stores that we had been selling the house plaques to – although we were now talking to the marketing departments rather than the product buyers. We developed the counting technology that allowed us to track many aspects of customer behavior, providing world-class data insights. We always had an eye on reliability, from our aerospace days, which proved invaluable, keeping repeat visits and repairs to a minimum, giving us good margins. At the outset we only found one other company in this space, but within two years there were more than 30, proving that we had spotted something that retailers needed. Continuous development, and the quest for perfection of over the next 10 years, meant that we were counting over one billion shoppers a year in 2007, not to mention employing 65 fantastic employees. At this stage we were selling not only to the DIY sector, but travel agents, motoring suppliers, fashion stores and mobile phone stores. Global expansion, distribution, sales and support presented us a new challenge, and a potentially expensive hurdle. From the very beginning, we had always self funded through bootstrapping, so the thought of other shareholders galvanized our opinion that the business would be in better hands with a company who already had this infrastructure in place. In December 2007 we sold it to the global market research company Synovate, now owned by IPSOS. Along the way, in 2001 in fact, there had been another lightbulb moment. While on honeymoon, I was desperately trying to get a glass of wine for my new wife. I was enjoying the sun on a lounger round the pool – how difficult can it be to get a drink I mused? Surely there was a better way of attracting the waiter’s attention, than waving my arm, or running to the bar in my Speedos! This set my mind racing. In 2001 the solution would have been wireless doorbell technology, the equivalent to the airline service call button – maybe something to develop another day, I thought. So in 2013 when I found myself with an empty inbox after the sale of SPSL – and some 12 years after the original thought had occurred to me – I set to work. We had started a new business, Geniusin Ltd, inspired by the secret work at Bletchley Park, where ‘Brute Mental Force’ was used to crack the ENIGMA machine. At Genuisin we aim to harness the UK’s engineering and scientific brains to solve everyday problems, taking ideas from the drawing board to the market place. This ‘glass of wine problem’ was definitely a project for Geniusin. It fitted perfectly: technology-based and could benefit from all our expertise in data analytics. In fact, we were able to take advantage of new technology, the smartphone, something that everyone now carries in their pocket. 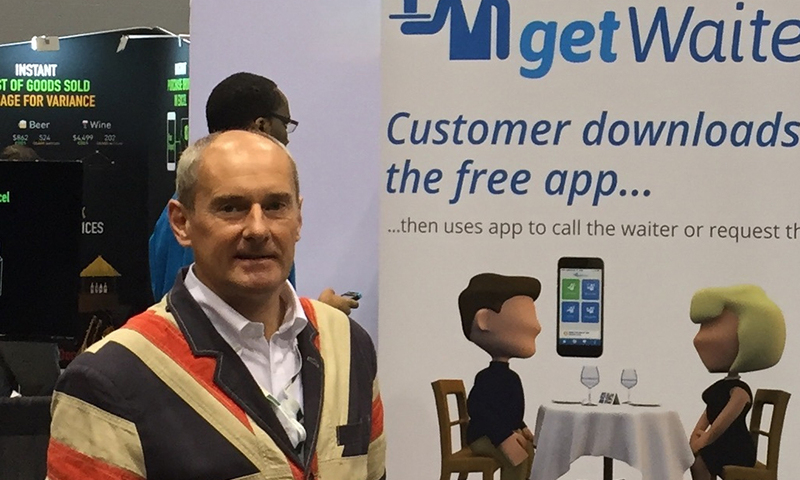 So the first project to come from Genuisin Ltd is getWaiter – a waiter calling app for the hospitality industry. It allows us to continue to generate data insight and analytics on a global scale, while giving guests at hotels and restaurants an even better service. It took three years to develop and get just right, as naturally it needed to fit our high reliability culture. We launched in the UK and USA last year, and it works equally as well in a small café in the backstreets of Peru as it does in the most luxurious five star resort hotel in Miami. What’s more, because the basic system apps can be freely downloaded by both the business and guest, it can be up and running in minutes anywhere in the world. The customers use the getWaiter app on their smartphone, and the business use a WiFi enabled tablet running the Waiter Station app, at the designated serving areas. A clear list on this screen shows who’s next, and whether they just want the waiter, more drinks or the bill. And of course, the guest can leave feedback for the business, to help them improve, or just to say thank you. 1) If you can put man on the moon then everything is possible, so don’t give up. 2) If it were easy everyone would be doing it. 3) Every business makes mistakes. It’s about how you deal with these that separates you from your competition. Your sheer dogged enthusiasm and commitment to fix it says more about the business than any sales blurb, and your customers will respect you for it. Paul is a successful entrepreneur with an electronic engineering background who enjoys taking projects from concept to market. Projects to date include: identifying niche retail analytics market and creating leading edge technology and insights company, SPSL (which later became Synovate Retail Performance) and co-founding Geniusin Ltd, an intellectual market exchange concept. The latest product to evolve from this arena is getWaiter!, a free app for consumers and businesses in the hospitality sector. Customers can use the app to get better service when they eat out: businesses can take advantage of details insights and analytics to increase performance and the customer experience. Great blog Paul. Love the informality which underpins a highly professional approach.